Home › Apparel › The Best Golf Rain Gear – Stay Dry! Rain. The natural archenemy of golfers around the world. If you live in a city cursed by rainy seasons, then you know how it feels to look outside and see those dark clouds forming. But a little bit of rain is no excuse to stop playing! In fact, if you are equipped with the best golf rain gear, then you can even look at it as a new challenge. Before we look at some rain gear recommendations, let us see how the rain affects your golf experience. The main effect that rain has on your game is that it reduces your grip. Moisture on your hands and club grip will make it more difficult to hold the club firmly. The wet ground will also cause your feet to slip more when swinging. This means you will take less confident swings, resulting in poorer shots and a terrible score. That is why it is important for you to have good golf shoes, as well golf gloves designed to combat moisture and maintain a strong grip. Golf is a game of concentration and the rain definitely does not help. There is also nothing worse than walking around with soaking wet clothes and feet. It will also be quite difficult to gauge the proper distance and angles if droplets of rain keep splashing your face. Therefore, having proper rain gear will help you keep dry and maintain at least some of your focus. The softer, muddier grounds means your ball will not roll like it normally would. It also means that you will probably chunk your shots more often. You won’t have to worry though about getting enough backspin on your approach shot, as the ball will just plug into the green (check out the best divot repair tools here). Your clubs will also get dirty after every shot, so make sure you bring a towel to clean your clubs! Now that you know the biggest factors that can affect your golfing experience during the rainy season, let’s take a look at the best golf rain gear available. In terms of retaining your grip under rainy conditions, the these gloves from Japanese brand Mizuno are some of the best. They come in a pair (one glove for each hand), and features microfiber suede palms that help retain traction even when soaked in moisture. In fact, they get even grippier when wet. You need not worry of losing your club and can just focus on delivering that perfect swing. These gloves fit the hand perfectly and prevents bulkiness thanks to its “3-D pre-curve patterning”. A rain specific golf glove is a must have when playing in the rain, and the Rainfit Golf Gloves from Mizuno is about the best you will find. 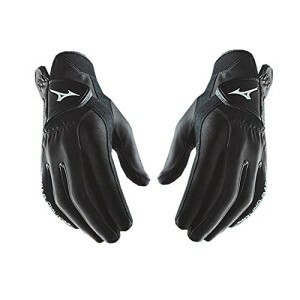 Buy the Mizuno Rainfit Golf Gloves here! This is a perfect way to keep your golf clubs dry when playing in the rain. This rain hood is made of waterproof, lightweight nylon and can be adjusted to fit on any sized golf bag . It is also designed with enough height clearance (14 inches), so that it will still fit over those long, oversized drivers. The Rain Wedge is super easy to install on your golf bag and offers quick access to your clubs. Just flip the cover back, pull your club out, and then retract the hood back to keep your clubs dry. It’s almost like a baby carriage cover. You can also fold it up, and store it in your bag when it’s not raining. Some people feel that the material used could be a bit higher quality, but for just 20 bucks, we don’t have any complaints. This is easily the best value golf bag rain cover on the market. You won’t have to worry about keeping your clubs dry, and can just focus on hitting the ball! 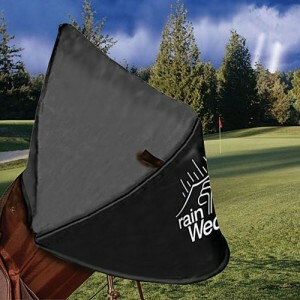 Buy the Rain Wedge Golf Bag Rain Hood here! Keeping dry and warm will help you stay focused on hitting that little white ball. This golf rain suit from Nike will help you do just that. This full-zip jacket and pants combo is made from 100% “Storm-FIT” polyester. This waterproof fabric will protect you from the wind, rain, and even snow. The fabric also breathes well, so it won’t feel like you’re in a sauna when you put this suit on. The Storm-Fit Rain Suit is incredible light and comfortable, so it will not hinder your swing or mobility in any way. One small downside is that there is no zipper/fly in the pants, so using the urinal can be a bit troublesome. This suit simply doesn’t allow leaks, from inside or out! For $100+, this jacket/pants suit may seem a bit expensive for some, but it is easily one of the best golf rain gear options available today, and is well worth the price. Buy the Nike Storm Fit Golf Rain Suit here! This golf bucket hat from FootJoy is perfect for golfing on rainy days. It is 100% waterproof, and will keep your head dry and warm even in the most torrential downpours. The full brim will also help protect your face from getting hit by raindrops. The DryJoys hat is extremely lightweight, and also scrunches up easily, so you can stuff it in your bag without problem. This hat tends to fit a bit large for most people, so you may want to try purchasing a size smaller than usual. 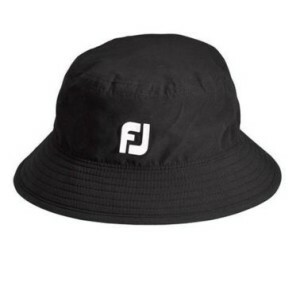 Buy the FootJoy Waterproof Bucket Hat here! 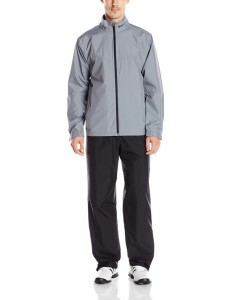 If you want to match the Nike rain suit featured above, check out the Nike Golf Storm-Fit Cap! Under Armour fans check out the UA Golf Bucket Cap here! The GustBuster Classic Umbrella is a tough as nails umbrella that features one of the best wind proof technology around. It has been tested to withstand winds of up to 55mph and up with no problem. 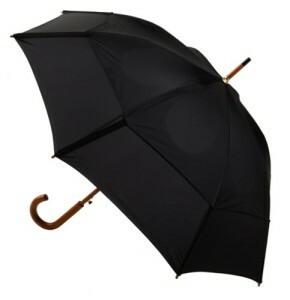 It is also lighter than your standard large umbrella and is even lightning proof (!!) thanks to its fiberglass shaft that is as durable as they come. If you are looking for the ultimate umbrella designed to be used in the toughest conditions then this one fits the bill perfectly. Buy the Gustbuster Classic Golf Umbrella here! If you have ever walked in wet shoes or socks for a long time, you know it’s one of the most annoying and uncomfortable things ever. Having wet feet will definitely affect your concentration, and cause you to mishit some shots. That’s why it’s important to have a pair of awesome waterproof golf shoes like the Adizero Tour Golf Shoe from Adidas. This slick looking pair of golf shoes are made a special microfiber leather, while the sole is made of ultra lightweight synthetic material. They are 100% waterproof and even come with a 2-year waterproof warranty. Weighing just 3.4 oz (approx 96 grams), this shoe is one of the lightest shoes on the market. 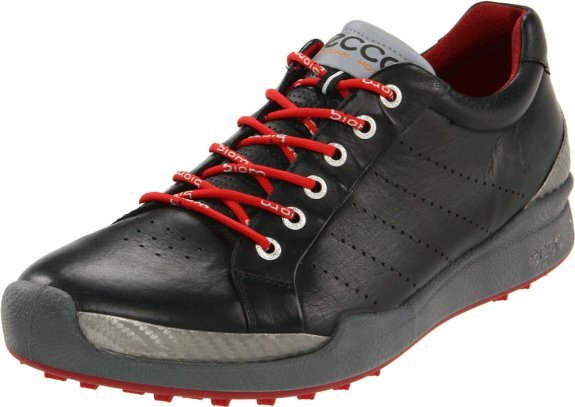 They are also extremely comfortable, which makes walking the course a delight. No more sore feet after your round! The 10-spike sole also offers great traction, which is especially important when playing in wet conditions. These are not just one of the best waterproof golf shoes, but one of the best golf shoes on the market, period. Better yet, right they are over 50% off (on Amazon)!! You won’t find a better deal than this. Make sure you pick up your own pair while you can! 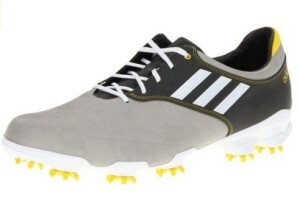 Buy the Adidas Adizero Tour Golf Shoe here! The rainy season is a huge obstacle for golfers to enjoy their favorite game but with the proper best golf rain gear by their side, neither sleet nor rain will be able to stop you! I have been trying to find a golf shoe brand that my husband states would be perfect and most supportive for him due to multiple orthopedic issues. He loves to walk golf course instead of ride. The shoe is a “ECO” OR “ECCO”?? He is also a size 13 or 14. Hopefully you could provide some information for me as where to look or a store or website to search. They should also be available at most local golf stores. 1 Pings/Trackbacks for "The Best Golf Rain Gear – Stay Dry!"